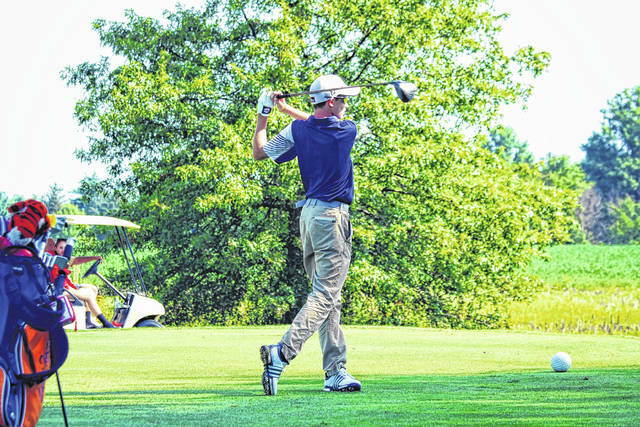 GALION — Early August means that the Galion Tigers’ golf squad has already started gearing up for the 2018 high school fall sports season. With the season already started and one tournament title in their hands, Galion is looking to mirror the success that they saw throughout their 2017 campaign in which they went a perfect 14-0 en route to a Mid-Ohio Athletic Conference championship. The season got off to a good start for the Tigers on Monday as they opened their season by winning the Clyde Invitational at Green Hills Golf Course. Senior Jack McElligott was the medalist with a score if 1-under par 70. The team won with a score of 311. Based on last year’s results, more successes are coming for Bryce Lehman’s team. Last year, Galion also won titles at the Galion Invitational last year. The 2018 version is Wednesday, starting at 9 a.m., at Sycamore Creek in Galion. They also were champs at Buckeye Central, Bucyrus and Norwalk. Mitch Dyer is the top player who graduated. Lehman is starting his seventh year at the helm and will be joined by first-year assistant coach Justin McMullen. Leadership will come from seniors McElligott, Matt Kingseed and Kaleb Harsh. Joining that group of seniors will be a pair of sophomores Matthew McMullen and Spencer Keller, who both had a huge impact on the performance of the team last year as freshmen. A new face to look for on courses throughout Ohio will be Max Longwell. In last year’s MOAC tournament, Galion bested Ontario 316-319. Galion was first at sectionals and second at the district meet, which qualified the team for the state tournament, where it finixhed sixth. A busy opening week continued on Tuesday afternoon with Galion at Marion Country Club for a conference clash against the Harding Presidents. On Wednesday morning at 9 a.m., the Tigers will be on their home course, Sycamore Creek, to host and defend their titles at the Galion Invitational. Opening week is set to conclude on Thursday when Galion heads to Deer Ridge Golf Club in Bellville for the Clear Fork Invitational. CRESTLINE — Head Coach Steve Garberich wants to improve on last season’s 3-6 finish, with three letterwinners on his small roster. Juniors Jonny Tesso, Spencer Harley and Devon Reed will be teeing off for the Bulldogs in 2018 in search of their third and second letters, respectively. Those juniors will be joined by incoming freshman Geoffrey Tadda, who looks to make an impact on the young Crestline squad. The Bulldogs compete in the Mid-Buckeye Conference but in 2017, the MBC had just two schools with golf teams, making league play next to obsolete. With little opportunity to play a season ago, the head coach remains optimistic. Crestline kicked-off their season on Tuesday, on the road, at the Buckeye Central Invitational. They will play host to the first round of the MBC tournament on Friday, August 10. NORTH ROBINSON — In 2017, the Colonel Crawford Eagles had a season that they’d like to leave behind. Crawford, led by 12th year head coach Brett Kaple and assisted by Nate Hill (five years), finished winless at 0-17. But, the Eagles will be returning key athletes in the likes of Gavin Feichtner, A.J. Johnson and Andy Brause. Feichtner will be looking for his second varsity letter while Johnson and Bruase are persuing their third. Colonel Crawford lost just one golfer to graduation in the spring of 2017 (Eli Shultz). Other linksters to keep an eye on for the black and yellow will be Noah Thornton, Seth Lohr and Cyler Hoepf as the Eagles are “just looking to improve each match” according to Kaple in an email. Upper Sandusky will remain tough over in the Northern-10 Athletic Conference after Carey and Ridgedale finished as co-champions in 2017. In the three prior seasons in the existence of the N-10, the boys golf title was claimed by the Mohawk Warriors. In the first official week of the season, Colonel Crawford headed over to take part in the Buckeye Central Invitational on Tuesday, August 7 before playing host to visiting Riverdale on Wednesday, August 8. GALION — The Northmor Golden Knights golf team returns four letterwinners from a season ago: Hayes Bentley, Ryan Bentley, Kamryn Ingles and Isabelle Szulewski. Hayes Bentley was named to the Knox-Morrow Athletic Conference first-team last year en route to qualifying for districts play. Ryan Bentley earned a KMAC second-team nod in 2017 for the 7-18 Golden Knights (6-18 within the conference). Three incoming freshmen will be joining the above mentioned letterwinners; Ethan Branch, Ethan Mullins and Brittany Maynard all look to help the Northmor upswing and move up the KMAC standings in the fall of 2018. Northmor will officially begin their season on Friday, August 10 when they tee-off for the first round of the KMAC tournament at Pine Lakes Golf Club in Mount Gilead. Pine Lakes is the home course for many of the squads in the conference, including the Golden Knights.